Doctors Stephen R. Powell, MD; Lauren Digiovine, MD; and Heath Lemley, MD represent Regional Eyes Associates and serve patients at GRMC. 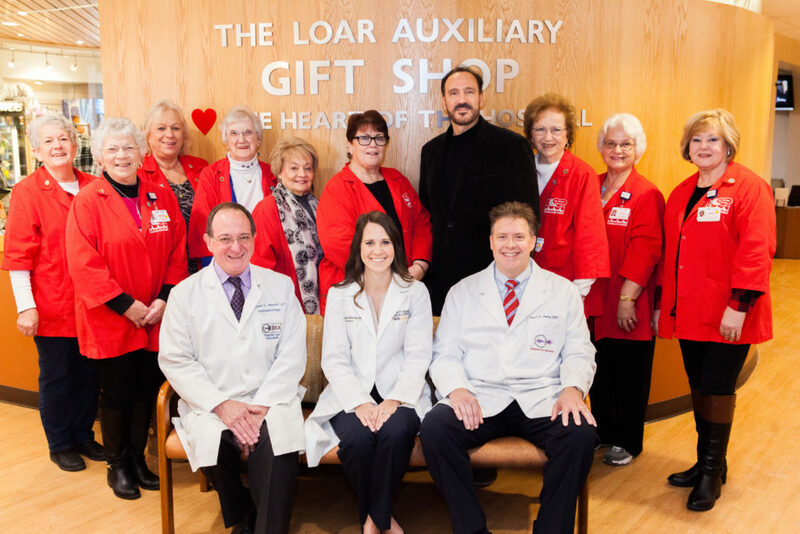 Oakland, Maryland – Thanks to a donation from the Loar Auxiliary, Garrett Regional Medical Center’s ophthalmic surgeons will be equipped with the latest technology in cataract surgery. 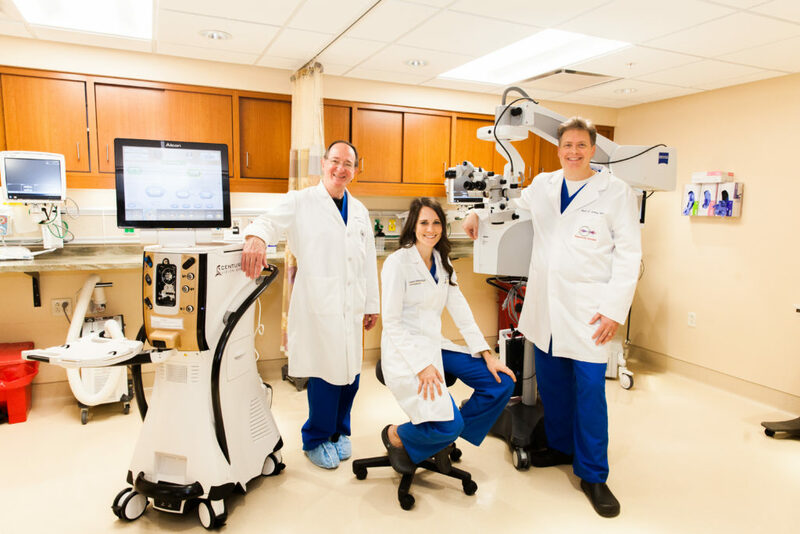 Doctors Lauren DiGiovine, Heath L. Lemley and Stephen R. Powell of Regional Eyes Associates currently perform cataract and other ophthalmic surgical procedures at GRMC. Back row pictured left to right: Betty Wolford; Shelby Carmack; Betty Crisp; Margaret Mowbray; Betty Pritt; Deb Hetrick; Mark Boucot, CEO; Phyllis Gank; Linda Sanders, and Molly Hartung. Front row left to right: Doctors Stephen R. Powell, MD; Lauren Digiovine, MD; and Heath Lemley, MD. The equipment, Centurion® Vision System, combines multiple, intelligent technologies and key features to provide surgeons control and improved efficiency during the cataract surgical procedures. The technology will aid the surgeons in optimizing the overall cataract procedure process through greater pressure consistency and stability. This will also enhance the patient experience by helping to reduce procedure and recovery time. According to the American Academy of Ophthalmology, more than two million cataract surgeries are performed in the United States annually. Cataract surgeries are among the most common surgical procedures in the world. A cataract occurs when the eye’s natural lens gradually turns from clear to cloudy, causing blurriness, discoloration and light sensitivity Approximately 24.5 million Americans have cataracts, a leading cause of blindness in the U.S. Cataract surgery remains the most effective way to help restore vision for those with the condition. To schedule an appointment or learn more about Regional Eye Associates, you may call the Oakland office at 301-334-1146 or Cumberland at 301-722-3500. The practice of Regional Eyes Associates consists of a team of 10 experienced, board-certified ophthalmologists, including cornea and retinal subspecialists. They combine their experience with state-of-the-art technology to provide patients in West Virginia and Maryland with the best eye care options available. Working with local optometrists, Regional Eye Associates provides comprehensive and subspecialty eye care in Garrett and Allegany Counties in addition to a number of sites in West Virginia. Visit www.readocs.com to learn more.